Dove Creek is the story of Patricia Faye Morrison, whose life spans from the mountains of Kentucky to the mountains of Idaho and a nursing job on the Nez Perce Indian reservation. The story chronicles her quest for meaning and identity as she goes about her duties, learning about and recognizing her own heritage in Native American culture. Recovering from a difficult divorce, Patricia frets about raising her two sons and struggles with self-destruction. Her story is one of perserverance and survival as she winds her way through the “Lesson of the Seven Directions,” a Nez Perce myth about finding one’s way to a true and fulfilling life. 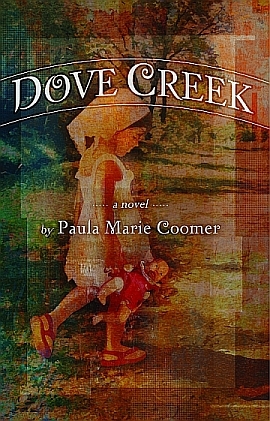 Dove Creek was a featured title at the 2011 Pacific Northwest Booksellers Association Fall Tradeshow. You can order Dove Creek from your local indie bookstore. Signed copies are available at www.bookpeople.net, www.andbookstooonline.com, www.earthlightbooks.com. Check out Dove Creek’s publisher at http://www.booktrope.com. Download an earlier Mp3 audio version at http://audio.krfp.org/dovecreek.html.